The Dylan clue tipped me off, and then stuff got in the way and I didn’t have time to proceed. 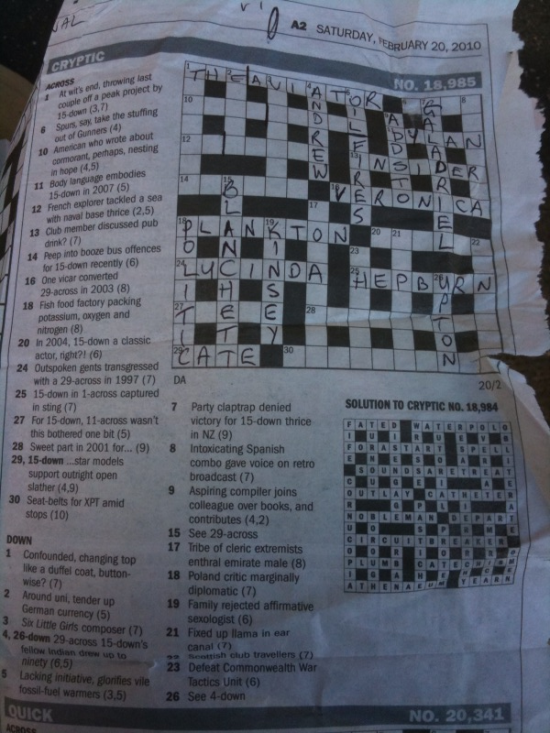 Yes well…….With so much hanging on solving one clue it was obvious what type of crossie we were dealing with here. Pretty good fun and some really neat clues. My picks: 10A ,14A, 9D and of course the crucial 29A ,15D.Quite an arm wrestle for a while. I agree that 9D was a good one and I thought 1A is worth a mention. That is the one that gave me 29A and 15D. A very good DA I thought. I thought it very good too, though had to refer to Google a couple of times for answers relating to the theme clue. I liked the way I had two of the themed answers early, from their wordplay, and still couldn’t get the theme! Liked 10A, 7D and a couple of well-disguised hiddens. Some queries over in the Confusions thread. I had 11, 14, 16 A from the wordplay and it stiill took me two more cups of coffee to get the theme. Loved it. My 86 year old mom is having difficulty, even after a few hints (such is Aussie fame). Definitely enjoyed the theme. Similar experience to AG and Peter, with getting some themed clues but still unclear about what the theme was. Favorite clues probably 7D, 14A and 4A/26D, especially after the explanation about the signifier (Confusions thread). And I enjoyed the cleverness of the wordplay of 29A/15D. I have to disagree with Ash, it was too easy to be a good DA. I beg to differ, JG. Not being a film buff, I’m all googled out now! Too much googling spoiled an otherwise good crossie for me. Some good clues though, including the all important 19A/15D. Whoops – that should be 29A, not 19A.